Looking at this unusual fragment, I was reminded that next year 2013 sees the 100th anniversary of the issue of Russia's Romanov Tercentary stamps - and, of course, would have been the 400th anniversary of the Romanov dynasty. I am sure there will be lots of Romanov items on offer in auctions around the world and maybe some really nice stamp collections among them. 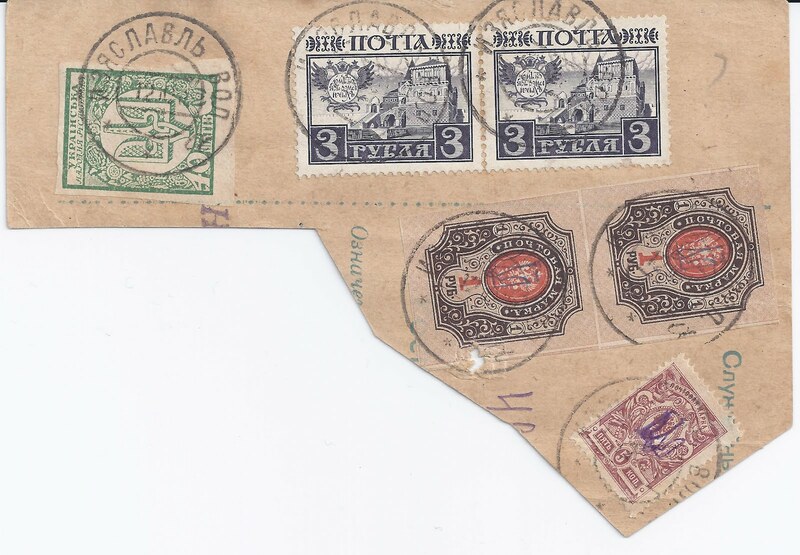 Lots of interesting collections can be formed from Romanov stamps and postal stationeries. The larger format of the stamps means that they are good for postmark collections. The stationeries are not all easy to find, especially in used condition, so that is a challenge for those who seek one. The stamps continued in use after the abdication of Tsar Nicholas II in 1917 and interesting collections of "late use" material can be made. Some of it is philatelic but probably most is not. The Soviets invalidated Romanov stamps from 10 March 1920 [That is the date I have - is it correct?] but even after that date there are occasional examples of post offices using Romanovs on Money Transfers and Parcel Cards - I discuss an example on my Blog of 10 February 2011. The fragment at the top is unusual. Part of a Money Transfer Form, it shows two 3 rouble Romanovs used in combination with First General Issue of Ukraine 40 Sh and three Imperial Arms stamps with Kyiv I Trident overprints. The cancellation reads IZYASLAVL VOL 12 10 18, so over a month into the Trident period. [ I think the place in question is also known as IZYASLAV ].